We are incredibly lucky to be living where we are, within easy reach of the beautiful Mediterranean Sea and equally close to the magnificent Sierra Nevada mountain range. The Sierra Nevada is the largest National Park in Spain, extending to over 85,000 hectares and is the home of Europe’s southern-most ski resort. We have been up the Sierra Nevada Ski Station on a number of occasions, but never to ski. We have wandered around, trying to look ski-ish, grabbed some churros and hot chocolate and optimistically talked of a day on the slopes. The problem with any ski resort is that it can be pretty expensive, once you have hired all the kit and bought a ski pass. Not only that, but when conditions are good, and a weekend approaches, any self-respecting ski resort can get busy, and I panic in queues for the ski lift. The last time I skied was 27 years ago, when I as a mere youth. Andrew’s last ski holiday was 6 years or so ago, so much more recent history. We both love the snow, and it seemed ridiculous to us that we have this huge wintery playground on our doorstep and we haven’t yet partaken of the seasonal fun. 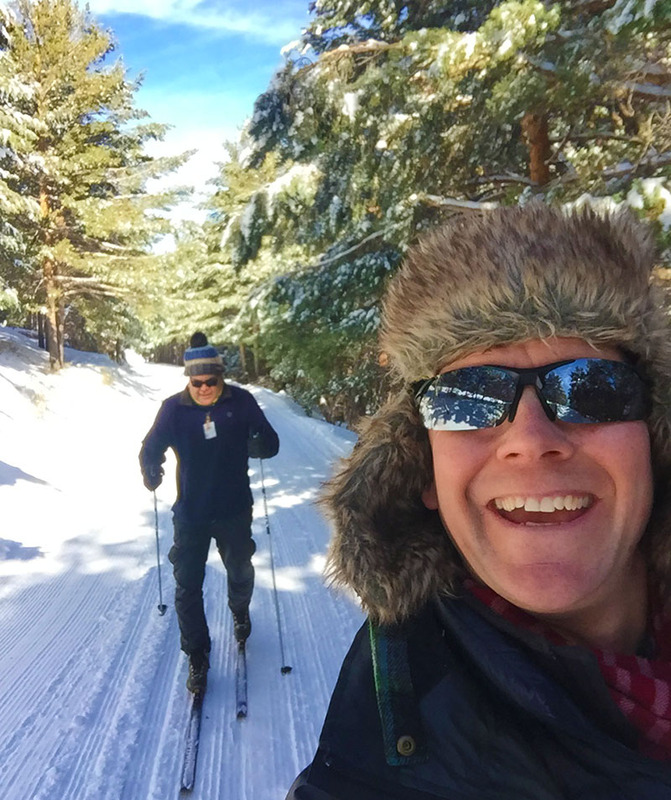 Shortly after we came to live here in Andalucia, a Spanish friend suggested Puerto de la Ragua as a good place to go if you wanted to try cross-country skiing. On a road trip last year to the village where Gerald Brenan once lived, we drove back from the Alpujarras across Puerto de la Ragua and then along the northern edges of the Sierra Nevada. It gave us a chance to see this small resort and we decided then that we would definitely return to ski. The last couple of weeks have witnessed some bitterly cold temperatures across much of Spain, and we have seen a good amount of snowfall, settling down to around 900 metres above sea level. Driving around this part of Andalucia, the Sierra Nevada is a constant presence, and it is genuinely hard to describe the sheer majestic beauty of this huge land mass, covered in snow, set against a clear blue sky and at its feet, the almond blossom gamely battles against frost to put on its annual blush. So, following fresh and significant falls of snow, the forecast looked ideal for a spot of cross-country. Neither Andrew nor I have ever attempted cross-country, but surely it can’t be too tricky, we thought. Last night, we got back home after I had finished work and before Andrew had to complete one of book design projects, and thought it might be prudent to have a quick look at a ‘How to….’ video on YouTube, which we duly did. Daniel, our YouTube guide, was a personable chap and the learner’s instructions took all of 5 minutes to impart. Important Tip: Weight Forward! Looked a doddle. Slight frenzy this morning, as we didn’t adjust the alarm, and we had hoped to make an early departure, but, as it happens, the timings were fine. We did take a quick detour to an internet cafe in Talará, one of the larger villages in the Valle de Lecrin. Last night, Andrew had set up a WeTransfer to send some files to London, and when he came down this morning, we were informed that the transfer would take another 53 hours! Our internet speed at the moment leaves much to be desired….The internet cafe consists of two rather old tower PCs in a corner of a petrol station shop, but the files were sent in 30 seconds; job done. The drive from Casa Magdalena to Puerto de la Ragua takes an hour and 45 minutes, but it's on dual carriageway for most of the way, and through stunning countryside north of the Sierra Nevada and south of the Sierra de Huetor. We stopped off to have a spot of breakfast just outside Guadix and then proceeded on our way. When you leave the valley between the two sierras, the landscape around Guadix changes dramatically. The pine-clad mountainsides are replaced by umber rock formations reminiscent of something from Arizona, and it is in these that homes have been created over the ages out of caves hewn from the golden stone. Driving past Guadix and towards Almeria, the entire range of the Sierra Nevada lies before you: a thick stratum of frosted pine forest topped with a dazzling, unbroken swathe of glistening white snow. Shortly before you turn off the dual carriageway, you enter yet another realm - the strange village of La Calahorra dominated by an Italian Renaissance castle dating from 1509 and that looks like something from ‘The Far Pavilions’. This impregnable-looking fortress sits on a hill, it’s four towers silhouetted against an impossibly beautiful mountain backdrop. The road to Puerto de la Ragua. Looking North. We left La Calahorra behind and immediately started snaking up through the forest. We didn’t meet another vehicle on this road, and we noticed this the last time we came. This is an unknown corner of Andalucia, well off any tourist trail. Indeed, many Spanish people seem never to have heard of Puerto de la Ragua, so why would it be busy? As the road climbs, the earth seems to completely drop away below, and the plains to the north of Guadix just disappear into a distant horizon. We entered another world and as the external temperature gauge in the car dropped, so the levels of snow beside the road increased, and branches of the pine trees drooped beneath the weight of stubborn white clumps, reluctant to let go. Puerto de la Ragua lies at 2,000 metres above sea level, and although it is described as a resort, this is a pretty loose definition. There is a small car park, a picnic area in the forest, a cafe/visitor centre (closed this season) and an equipment hire office. Behind and in front of the visitor centre, there are two steep hillsides prepared for tobogganing*, which is a major draw for visitors. I say a major draw, but this is not a busy destination, and it is all the more stunning for that reason. When we arrived, there were probably no more than 20 cars in the car park. We sailed in to hire our equipment without delay and set forth. It is worth mentioning that a day of cross-country skiing here is inexpensive. Equipment hire (skis, boots and poles) and a day ski pass costs the princely sum of €16 per person. €16!!! I would also add, at this stage, that I, normally most organised, arrived at the car park to find that I had not put my jacket in the car. It was chilly up there, but fortunately not so chilly to deter me from having a go on two bits of thin flexible material and venturing into the woods. Cross-country skis are very narrow......and long….and lightweight. The poles are long and the boots are far more flexible than traditional ski boots which are just ridiculous. Andrew and I remembered Daniel’s YouTube advice: Weight Forward. The technique, to get started, is similar to a hiking stride, pushing off with the front of the foot with each stride. This pushes down the fish-scales that line the centre underside of the ski, giving grip to propel you forward in an elegant glide. Well, that all went swimmingly. 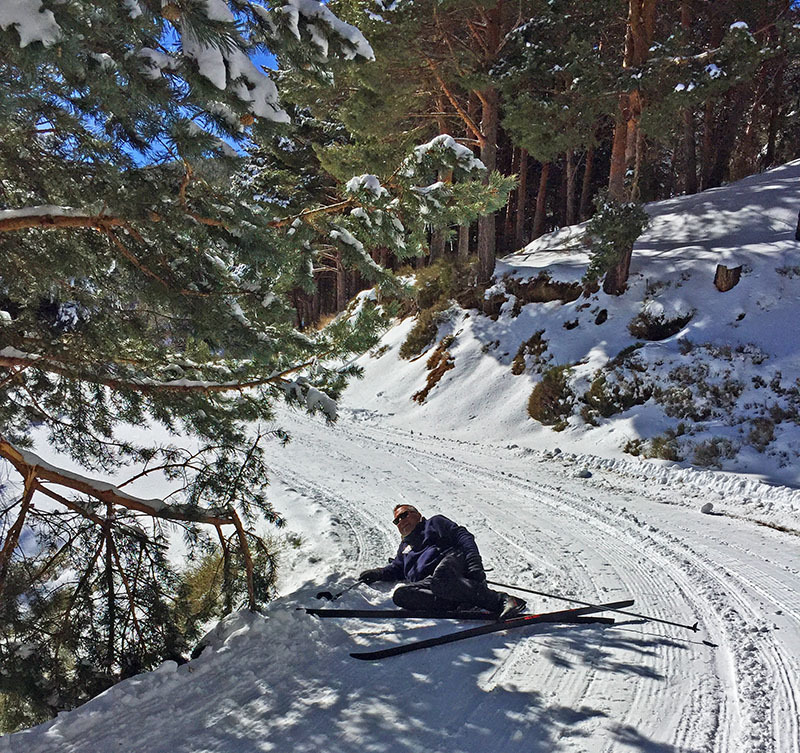 We took the easy piste, the Pista de Laroles, which runs through the most beautiful pine forest. The outward leg was up a gentle incline, so it was relatively easy to lean forward and take gentle strides in order to advance gracefully. I say easy, the skis were not much wider than ice skates, and if you hit a rut, the ankle tends to go over, and you don’t have that ankle support that you do with a rigid ski boot. Weight Forward…Daniel would have been proud of us. Daniel would have been proud! Coming back was a slightly different matter as it was down the gentle incline and we suddenly had to deal with a variety of techniques: Hiking stride, push and glide or just a downhill snowplough. Changing techniques does little for the rhythm, and we had both just found some sort of rhythm. The skis are narrow, the boots are only attached at the toe and everything felt awkward. Shoving all my weight forward just made me feel like a sack of potatoes being pushed down a narrow-gauge railway track. The scenery was breathtaking; truly awe-inspiring. We live in the most beautiful and varied part of the world. We did love carving our way slowly along these snowy paths, surrounded by silence and nature. I fell over, not once but an increasing number of times. Andrew fell over, but not quite as often as his elephantine partner. On a couple of occasions, I managed to ski down a hill with a degree of control, and slowly stop by distorting my legs into some tangle that created a makeshift plough out of my skis. I felt a sense of achievement. We got back to base and decided to venture onto another piste, as we were informed that it was very picturesque. It was, but by this stage, I could feel myself flagging. We had been out for 2 and a half hours….two and a half hours of cross-trainer exercise, and my poor old legs were beginning to go their separate ways. I think Andrew might have been tempted to complete the new circuit, particularly as we were overtaken by a learner taking instruction - the ignominy. I fell over again and decided that was probably enough. Looking at some of the short videos that Andrew took of my attempts indicate that it was the right time to have lunch and a rest. We managed to get back to the base just as our overtaking learner friend completed the new circuit looking much moe confident and rather too satisfied for my liking. We both love skiing, and we both love being outside in the snow and the fresh air, but goodness, we were exhausted by the time we had eaten lunch and got back in the car. I concede that I am not an elegant or even vaguely accomplished cross-country skier, and probably never will be, but we will be back in this incredible winter-wonderland of barely-touched pistes, few people, and gorgeous, gorgeous, gorgeous scenery. *Please note that, on the prepared toboggan slope, you can only use the toboggans provided by the resort. The day hire charge is €8 and includes pass, toboggan and insurance.